just listen to that , especially the beginning..TERRIFIC!!! I agree! Paul is fantastic!!! At Lovebox when TWM started did you also get a really funky 'OMG ' feeling swelling up inside you?? Last edited by troll on Sat Dec 08, 2007 5:44 am, edited 1 time in total. 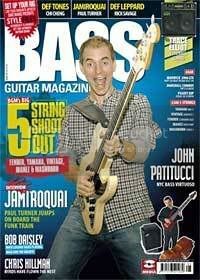 troll wrote: "Paul Turner is a great bassist, but he's just playing the basical bass line"
amazing! i added you at msn! I was in front of him at the FESTIVAL du GAOU...i can't forget his smile and his look! listen the jazz cafe show OOOOOOO MY GOD AMAZING ! Again I understand '' rubbish '' . My old language problem . What is ''plz'' ? What is '' musicman '' ? i prefer Fender but he sounds really amazing with musicman! Common sense ? Indeed ...used it . Rather scary ,that . I didn't put it there .Hope , noone with a rope or a knife . None of the bass players after Stuart have measured up to his ability. I've only seen Paul Turner live so I can't speak for his live performance vs. Stuart's and Nick's. He played very proficiently when I saw Jamiroquai, but his slap did sound terrible on Alright (although I think that was mainly because of the settings on his bass and amp more than his technique). Nonetheless, Stuart's bass is superior on every album he's on. 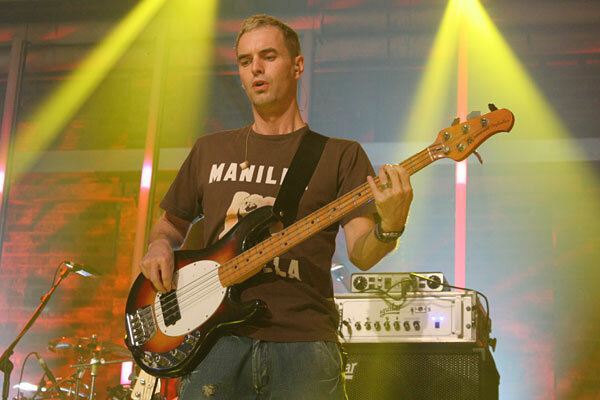 Most of the Jamiroquai tracks with standout and memorable bass lines belong to Stuart. The one exception that comes to mind is Don't Give Hate A Chance, which isn't Paul but Derrick McIntyre. Jester_z99 wrote: None of the bass players after Stuart have measured up to his ability. I've only seen Paul Turner live so I can't speak for his live performance vs. Stuart's and Nick's. He played very proficiently when I saw Jamiroquai, but his slap did sound terrible on Alright (although I think that was mainly because of the settings on his bass and amp more than his technique). doh! not this subject AGAIN!!! errr, those of you that were hoping that Paul Turner playing a musicman would sound anything like stuart zender playing a warwick streamer are clearly mad. Stu made the warwick sound all his own, but it's important that for any band to stay fresh and try out new ideas, they need to change. Look at james brown, parliament, funkadelic, tower of power, all funk acts that got thru musicians real quick, but are still hugely sampled by the industry because their licks remain fresh. Its not only the sound you like, its what he did with the notes, you should take the time to listen to some of his other work outside of JQ and see what i mean. Loving the fact that some of you think that Pauls basslines are too basic and sound the same, what role do you think a bass player plays within the band exactly???? There's the small point about bridging rhythm and harmony, so in order to complement the other musicians, you have to work with them, not go off on selfish plank spanking. If you want music that consists of bass players just spanking off, go buy the chilli peppers or something. My opinion? Stuart is an amazing bass virtuoso, and takes a really dynamic approach to chord progression. Paul is still very new to the band, but has shown he can provide good, solid support at live gigs, i dont doubt he'll get better with time, he's doing exactly what the rest of the musicians expect of him. He's good at what he does. As for the intro to travelling without moving, Pauls banging on that open E string then running up the E perfect minor scale. Its probably the first chord that any bass player learns and spends weeks banging away like a bedroom rock star. top stuff but actually really easy to learn, id suggest any of you budding musicians pick up a bass and try it. "The new issue (#28 ) of Bass Guitar Magazine (UK) has Jamiroquai bassist Paul Turner on the front cover together with an interview. The magazine is available now in the UK from all good stores (I couldn't find any near where I live so hence no quotes from the magazine!) and will no doubt be available soon to order as a back-issue from the Bass Guitar Magazine website." I think that Paul is a great bassist, just listen to the bass lines in Radio, Runaway and you will see some amazing riffs. On the other hand i think both Turner and Fyffe do not live up to Zender.. His lines were mind-blowing!! I think Paul's playing will expand more as the band progresses but right now it is safe to say he is not as good a bass player as Stu or Nick. Stuart Zender = The Man!!! if you ask me,Stu was really the best.nick was very good in keeping up with some of stu's stuff,but stu's still a LIIIIITTLE bit better.paul is also doing a good job but not like the two previous,but we still don't have the right to talk of him in any bad way,he's still a great bassist and he deserves our support just as much as stu and nick did. Paul Turner is awesome,I think JMQ is very well with him.He has experience and the man funks.Ok,I dont want to compare him with Stu,becouse they are 2 different worlds.Both are awesome,but Stu is more underground,i dont know,but along with the old JK(the underground JK) JMQ was genius,unique performances......and more. i wonder if one of those who love stu. more then paul ever seen him playin live before ten years ago???????? ?or just hear him from the cd album i thing the answer is no because they was too young that time and maybe or sur never knew somethin about jamiroquai!!!!!! i am lucky because i have see jamiroquai for the first time 1997 at that time stu. on the bass and that was great gig ,but not only because of stu. ^``^ derrick and sola are great artists . i ve seen paul for the first time with jamiroquai 2005 on there dynamite tour and they played fantastic performance just great . i love the firsts album from jamiroquai with stu but my favorites are sycronized , funk oddessy and dynamite . life is changing and if there is no change so we are diying . paul is real funkadelic cosmic boy also great artist and i respect his work . i was readin the same on jamirotalk from the same user what paul must or must not do or play .. i think its his bissnesse to play or not what he want.